My name is Richard Oram. I am one of Blue Boutique’s professional full body piercers in Salt Lake City. I have over 15 years of experience. I have professionally performed over 40,000 piercings during my career. I am committed to performed fast, accurate, safe, professional piercings in a clean aseptic environment. Today, I’m blogging about the navel piercing. It is a widely popular piercing, mostly located on the top rim of your “belly Button” . It has become one of, if not the most the most common piercing in young females today. The popularity rivals that of the earlobe piercing. The piercing is a virtually painless, simple procedure lasting only a few seconds when performed by a skilled professional. The jewelry worn in the navel is call a “curved barbell”. Some people have referred to them as “banana bars” because of their curved shape. The ends of the jewelry typically has a gemstone attached to one or both ends.The Jewelry comes in many different styles and colors. All jewelry inserted in a healing piercing should be made out of either 316-lvm ASTM f-138 Implant grade Surgical Stainless Steel or ASTM f-136 6AI-4V ELI Titanium. Jewelry should be “internally threaded”. This means the end cap ball threads into the barbell. Never be pierced with “externally threaded jewelry. This type of jewelry is cheap. Jewelry not made of surgical stainless steel and can cause micro tears in tissue that can harbor bacteria that may lead to a infection. The Navel piercing is rumored to have been around for more than 5,000 years. It was started in ancient Egypt. It is said only the Pharaohs or his family could have their navel pierced. The belly piercing was a status symbol for royalty. In the past the only person you would see in America with a body piercing “other than the ears” were sailors and tattoo artists. Piercings as well as tattoo’s were labeled as “taboo” by mainstream conservatives. It wasn’t until 1993 when body piercing was generally accepted as a mainstream piercing. The navel should only be preformed on someone with a developed “innie” type of navel. This means the the curve of the lip should have at least 3/8 of a inch depth. 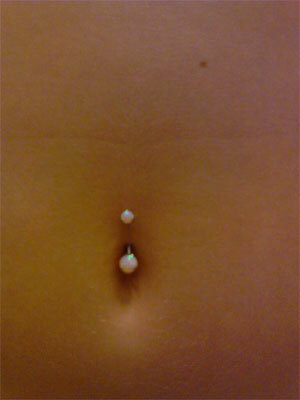 The navel should never be pierced on someone with a “outie” style navel. As with all body piercing there is a risk of a secondary infection you do not follow the suggested after care reccomendations. Never let your friends pierce you at home or never pierce yourself. A body piercing should only be preformed by a skilled professional in a sterile environment. This is to help minimize the risk of getting an infectious disease. A piercing heals in stages so diligence is required to during the first few stages! A simple warm saline soak 2 times a day is recommended. Avoid scented soaps and body washes, rubbing alcohol, ointments,or peroxide! For complete aftercare instructions feel free to stop by the Blue Boutique and ask one of our highly trained, knowledgeable piercers.! The navel is a very easy and beautiful piercing that has transcended the entire body piercing world. whether it is your first piercing or 50th the Blue Boutique has the largest selection of high quality body jewelry and highly skilled and experienced body piercers always on staff! Let us help you in making the right decision for your and your new piercing! You can get pierced at the Sugarhouse Blue Boutique or get pierced at the West Valley location.